As I look at this, I LOVE that reflections, learning, questions, and students stand out to me, as the larger the word, the more often I used it in my blog posts. I also see Twitter, leadership and leaders. I feel proud that the focus of my blog is evident in this summary- I use this blog to reflect on leading and learning. I hope to continue this work in the new year. What would your word cloud look like? 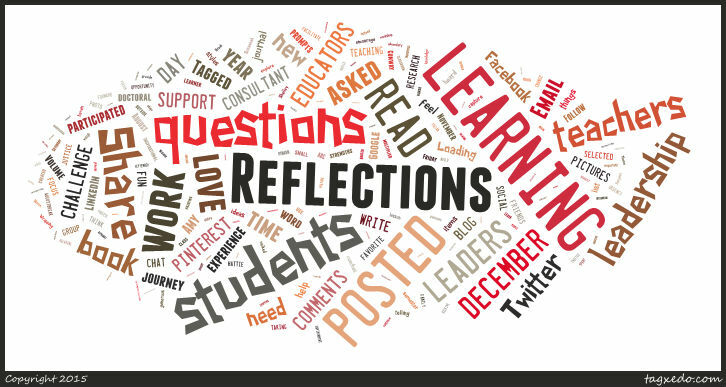 This entry was posted in Reflection and tagged blogging, focus, key, leadership, leading, most used, questions, reflection learning, students, word cloud. Bookmark the permalink.